FitNotes includes a small selection of common exercises which have been organized under a few general categories (muscle groups) to get you up and running quickly. However, it is possible to completely customize these exercises and categories in order to better suit your training if necessary. 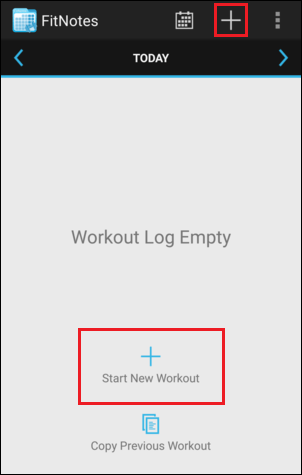 Navigate to the Exercise List by tapping the button on the Home Screen or by tapping Start New Workout if no exercises have been logged yet in the current workout. The list of categories will be shown initially. 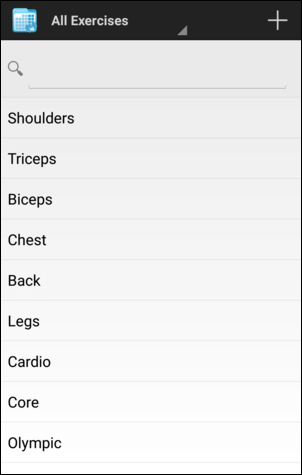 Tap a category to view the exercises it contains or use the search box above the list to find a specific exercise. You do not have to search for an exercise in its entirety but can instead enter partial terms to speed things up, e.g. 'fla ben' will find Flat Barbell Bench Press, Flat Dumbbell Bench Press, etc. If you wish to track an exercise that is not included by default then you can create it by tapping the button above the Exercise List. Enter a Name for the exercise. Select the Category that the exercise belongs to or create a new category. The exercise types marked [Pro] can be unlocked by purchasing the FitNotes Supporter app on Google Play. Enter any additional Notes that are relevant to the exercise. These could include tips about form, equipment required to perform the exercise, or machine settings for example. Tap the button to save the new exercise. Tap the button if you would like to save multiple exercises in quick succession. The current exercise will be saved but you will remain on the New Exercise screen and the Name field will be cleared allowing you to quickly create another exercise. You are able to create a new category in order to represent a muscle group which is not included by default (e.g. Forearms) or perhaps to group exercises which do not fit one specific muscle group (e.g. Olympic Lifts or Yoga Movements). Tap the button next to the Category field on the New Exercise screen. Enter a name for the new category. A default colour will be assigned to the category which will be used to identify workouts in the Calendar which contain exercises belonging to this category. Tap the colour circle to change it. Press-and-hold an item in the Exercise or Category List to enable selection mode. Tap the button above the list to edit the currently selected item. Tap the button to delete the item. You can also tap multiple items while selection mode is enabled if you would like to delete more than 1. When a category is deleted all exercises belonging to the category will also be deleted. When an exercise is deleted all data belonging to the exercise - such as training logs, goals, and comments - will also be deleted. The Category List can be ordered manually (default) or alphabetically. To change the ordering method press-and-hold a category in the Category List to enable selection mode. Tap the overflow menu at the top-right of the screen, select Sort Order and then choose either Manual or Alphabetical. When Manual ordering is selected, press-and-hold the icon on the right-side of the category name to drag the category to a new position. It is possible to display the category colours within the Category List for easy reference. Press-and-hold a category in the Category List to enable selection mode, then tap the overflow menu at the top-right of the screen and select Show Colours.